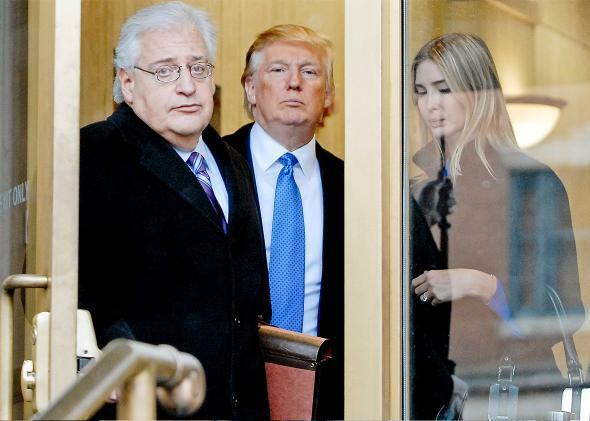 David Friedman, Israel ambassador pick, helped Trump with casino debt. David Friedman, Donald Trump, and Ivanka Trump outside bankruptcy court in Camden, New Jersey, on Feb. 25, 2010. David Friedman, Donald Trump’s soon-to-be ambassador to Israel, is getting a lot of attention Friday for having said that center-left American Jews who criticize the Israeli government are “far worse” than individuals who “turned in their fellow Jews in the Nazi death camps.” And said attention is fair, because that’s an awful thing to say. My goodness! But Friedman is also notable for another reason: He’s the bankruptcy lawyer that helped Trump pull off one of his greatest large-scale deadbeat screw jobs. Someone made money off Trump Hotels, though: Donald Trump. His contract kept him well-compensated personally even as he burdened the company itself with unsustainable debt. Like his presidential campaign, meanwhile, Trump Hotels & Casino Resorts spent big sums of (other people’s) money on other Trumpworld properties—at one point estimating in a public filing, for example, that it had paid $470,000 for “Trump Ice”-brand bottled water in one year. Fortune estimates that on the whole, Trump Hotels—and its zombie post-bankruptcy successor, Trump Entertainment Resorts, which itself went bankrupt in 2009—paid Donald Trump a total of $82 million. Trump’s bankruptcy lawyer, throughout all of this, was David Friedman. It was Friedman who filed for the bankruptcies in 2004 and 2009 and negotiated with the creditors to whom Trump Hotels had gotten in too deep. Neither Trump nor Friedman, however, was ever accused of doing anything improper or illegal in relation to Trump Hotels. Running a company into the ground and then getting to keep all of the enormous windfall you reaped while doing so, as we all learned after the 2008 bank crashes, is often just the way things are done. In other words, Friedman did a pretty good job on Trump’s behalf. Now, if confirmed, he gets a big reward: Becoming the United States’ ambassador to one of the world’s most explosive geopolitical hot spots despite a total lack of diplomatic experience and a history of making incendiary statements. What could go wrong?